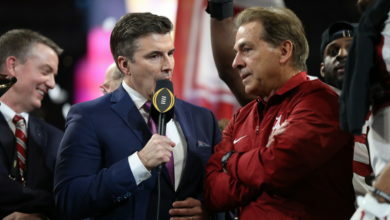 Transcript: ESPN’s College Football Playoff National Championship Conference Call with Chris Fowler and Kirk Herbstreit - ESPN Press Room U.S.
ESPN college football lead broadcasting team Chris Fowler and Kirk Herbstreit discussed the College Football Playoff National Championship Presented by AT&T featuring No. 1 Alabama vs. No. 2 Clemson. Fowler and Herbstreit will call their fifth straight CFP National Championship, along with Maria Taylor and Tom Rinaldi, on Monday, Jan.7, at 8 p.m. ET as part of ESPN’s MegaCast presentation. A transcript of the call is available below.